The Walton Family Foundation pledged $100 million Tuesday to support racially diverse teachers and school leaders, integrated classrooms, innovative curriculum models like Montessori, district and charter school partnerships, and schools that serve special education students. Those priorities signal a new phase in the foundation’s 20-year philanthropic efforts to increase access to high-quality schools for children across the United States, mainly by funding public charter schools. The foundation released a report this week to explain its latest thinking on improving education, called Rooted in Opportunity: The Walton Family Foundation’s Approach to Starting and Growing High-Quality Schools. Over the past two decades, the foundation said, its strategy has evolved as evidence of “what works” has begun to show, while fueling growth in the charter school sector remains a core principle. “While we will continue to support proven models, we believe the time is ripe for new visions of schooling, for schools both pedagogically and culturally diverse, and for schools that offer more thoughtful supports for students with special needs,” James Walton, who serves on the foundation’s board of directors and is the grandson of Walmart founder Sam Walton, said in a letter accompanying the report. Starting and scaling high-quality public charter schools, a continuation of the foundation’s signature work, which began with four schools in 1997. Since then, the foundation has provided $424 million in startup funds for 2,235 schools, including national networks like KIPP and fast-growing IDEA Public Schools in South Texas. After Sternberg spoke, IDEA co-founders Tom Torkelson and JoAnn Gama were inducted into the National Charter School Hall of Fame. In April, the Walton Family Foundation announced $300 million in loans to help established charter networks manage facilities costs associated with continued operation or expansion. Building costs are often a major hurdle for charter networks in states where they do not receive facilities funding, only attendance-based operation funding. District and private schools embracing accountability and autonomy. In 2009, a grant to Denver Public Schools marked an expansion of the foundation’s scope to include school districts interested in creating diverse options for families and including varied models within a portfolio or system of schools. The approach is gaining popularity, and it looks different in each city where it sprouts. 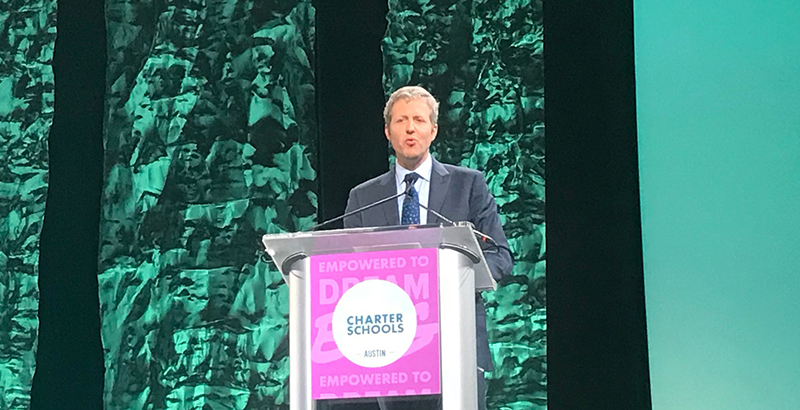 In Denver and Indianapolis, the portfolio includes both traditional and charter schools, while in New Orleans, the public schools system is made up almost entirely of charter schools. In Texas, the state education agency launched an initiative, the System of Great Schools, in 2017 to encourage its 1,200 school districts to create systems with more autonomy for individual schools. Superintendents from some of these districts spoke at the conference this week, highlighting the need for charter-district collaboration. The Walton Family Foundation plans to support such initiatives, as well as private schools committed to increased accountability, and a mission to serve low-income students. Rooted in Opportunity specifically mentions the option of working with private schools receiving vouchers, public money that can be used by low-income and disabled students, among others, to help pay private school tuition. More early-stage support for teachers and leaders of color. While more than 50 percent of students in the United States are non-white, 82 percent of teachers are white, according to a 2016 report from the U.S. Department of Education. The percentage is similar for principals, and fewer than 10 percent of superintendents are people of color. At the same time, research shows that students benefit from seeing teachers and leaders who look like them. Sternberg emphasized the importance of supporting teachers of color early in their education and career to remove barriers along the way. Navigating the transition from secondary to postsecondary. College graduation is the new frontier for many successful charter operators. Using the same disruptive ethos they applied to K-12, charter networks are advancing various strategies to help low-income students clear various hurdles that follow them from high school into college. Meeting the unique needs of special student populations. Students with disabilities are “dramatically underserved by the current system of schools,” the foundation writes in Rooted in Opportunity. The report cites research that the majority of the country’s special education population, roughly 13 percent of all students, are capable of learning with their general population peers when properly supported. High expectations and the support to meet them are missing in most systems, according to the foundation. More schools that serve students of diverse backgrounds. Bolstered by research from the Century Foundation, more schools are integrating classrooms using socioeconomic status, as has been done in Chicago and in Cambridge, Massachusetts. The Walton Family Foundation will support systems that pursue similar work, and it pledges in Rooted in Opportunity to increase funding for research to determine best practices in socioeconomically diverse classrooms. Research and advocacy are another part of the foundation’s strategy. While constantly doing “more,” Sternberg admitted that no one funder could tackle the entirety of the problem — the lack of access to high-quality schools. “That’s why strong policy at the state level is so important,” Sternberg said. Although the foundation is prohibited from political activity because of its nonprofit status, the Walton Education Coalition is involved in political campaigns and advocacy around education issues at the local, state, and national levels, as school choice and reform remains a divisive topic. Sternberg insisted that the work continues as it was described by the late John Walton before Congress in 1999. Education was not and is not a political issue for the foundation, Sternberg said, echoing Walton; it is about children, and empowering parents.